Making your driveway out of concrete is one of the best decisions you can make for your home. Namely, it’s a great improvement to add because concrete is long lasting no matter the traffic volume. However, adding sealant can double the life of a regularly maintained concrete driveways lifespan. In this blog post, we’ll look at some of the other benefits of sealing your driveway and when you should do it. The process of sealing your driveway involves applying a commercial strength concrete sealer to the top layer of your driveway. While the application process is fairly straightforward, depending on your skill level, it may still be best to hire an experienced concrete contractor to apply the sealer. Long Lasting. A sealed concrete driveway can last much longer than an unsealed carport. Although a driveway that hasn’t been sealed takes time to breakdown, its deterioration is inevitable. The primary reason concrete doesn’t last as long without sealer is that it’s a porous material. As such, it absorbs moisture from the rain and snow; this water accumulation leads to cracking as the water freezes and thaws. In contrast, with sealed concrete you don’t have to worry about water seeping through since the sealant makes it non-porous; this prevents it from developing cracks. Improves the Aesthetic. Another benefit of applying a sealant to your concrete driveway is that the chemicals give it a nice shine and a rich color that won’t fade. You can also choose the level of gloss on your driveway as there are different types of sealant. Alternatively, you can even change the color of your driveway by using tinted sealers. But the bottom line is that no matter which option you choose, concrete sealer can vastly improve your home’s aesthetic appeal. Adds Value. In addition to improving your home’s appearance, sealing your concrete driveway can also increase your home’s value; this can come in handy should you ever plan to sell your home. It will not only add to your home’s value, but it could also have a positive effect on the surrounding homes. Stain Resistant. Stain resistance is another benefit of sealing your concrete. Residential driveways are exposed to more grime and dirt than one could imagine. And no matter the source of driveway stains, all of them look unsightly and are difficult to remove. However, with the aid of a good sealer driveway stains can be a thing of the past. Very Affordable. Perhaps one of the biggest advantages of sealing your concrete is the cost. It’s very affordable. In fact, compared to what you could save as a result of adding sealant the cost is almost immaterial. So given what we’ve just discussed there’s really no reason not to do it. Before you seal your driveway, there are some things you must know. Chief among them is when to seal your concrete. For newly poured concrete the industry standard waiting period is to wait 28 days after the concrete has been poured before you add sealant. Giving your driveway ample time to cure allows the outdoor air to evaporate any moisture so that you’re not pouring sealer over damp concrete which would reduce the sealer’s effectiveness. Likewise, if you’re adding the sealant to an existing driveway, be sure to do it under dry weather conditions. 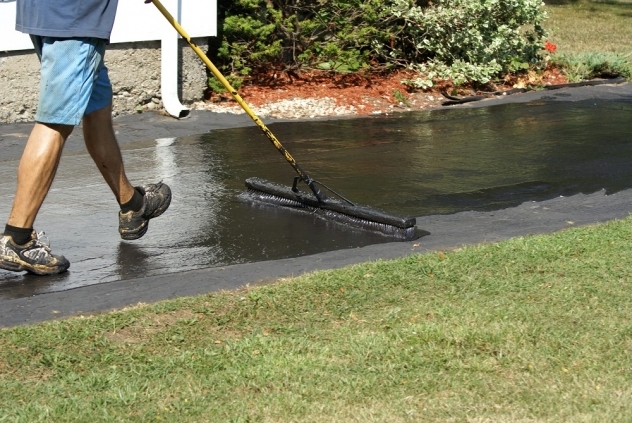 After the initial sealer application, you will need to seal the driveway periodically. As soon as the concrete begins to dull, you should apply a new layer of sealant to improve the look and functionality of your driveway. To sum it all up, sealing concrete is important. It adds to the look and feel of your home and adds a new level of utility to your driveway. Questions or concerns about concrete sealers? Contact us today.